The list of abusers was given anonymously to the Sinn Féin leader. THE MAN ALLEGED to have sexually abused Paudie McGahon was on a list of names given anonymously to Gerry Adams according to Sinn Féin. Adams made the claim in the Dáil this week and Martin McGuinness repeated it today. 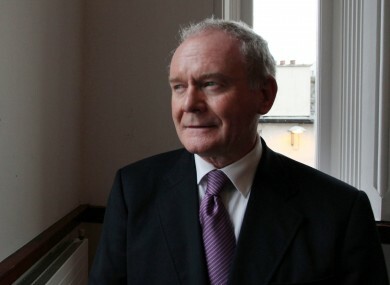 McGuinness claims the Sinn Féin leader only became aware of the name in the past two weeks. Speaking on RTÉ’s This Week programme, McGuinness said that he ‘doesn’t know how the list of information was provided’ to Adams. “I don’t know how the list of names was provided, I don’t have any information about that at all. I know that a list of names was provided to Gerry and that he passed on the information to the gardaí,” McGuinness said. McGuinness says Adams was made aware of the name of the alleged abuser in recent correspondence with the BBC Spotlight programme. In the Spotlight programme, McGahon alleged that he was abused by an IRA volunteer and later subjected to a “kangaroo court” process. Northern Ireland’s Deputy First Minister says the individual named as being involved in setting up a kangaroo court denies this. McGuinness was then asked whether this meant that he didn’t completely believe Paudie McGahon’s claims, McGuinness said it did not. Yesterday, Sinn Féin said that the party is to take legal advice over claims over claims of an internal Sinn Féin investigation into sexual abuse in the republican movement. Four senior party members are alleged to have been part of the investigation and McGuinness denied this, confirming that legal advice will be taken. Email “Paudie McGahon's alleged abuser was on Gerry Adams list”. Feedback on “Paudie McGahon's alleged abuser was on Gerry Adams list”.